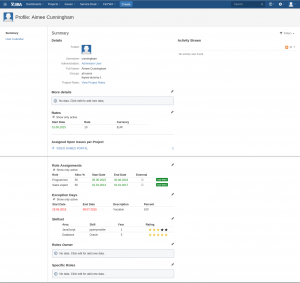 FEYWA for JIRA is designed to help every member of your organization. Find out who benefits from this plugin. Finance director can decide, which project is worthwhile to start and gets regularly the reports which projects are most profitable. 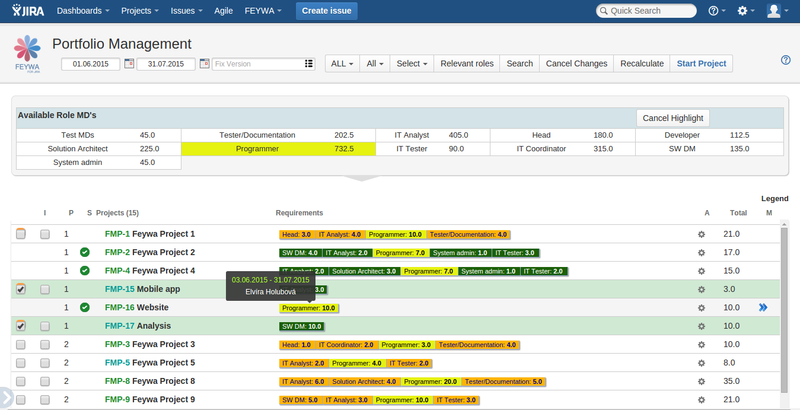 FEYWA for JIRA enables to create what if scenarios for different situations. 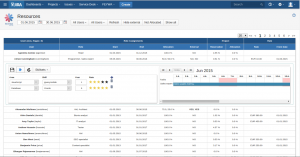 Project portfolio also helps to prioritize business ideas and future project so the organization stays in line with organization business strategy. HR director gets actual information about their organization, what roles are in lack or surplus and which employees are valuable for organization and which are not. 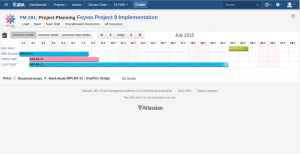 All inputs from FEYWA for JIRA can be used for stick with stronger or to redefine business strategy. Release manager is the one who decides what gets into which release. 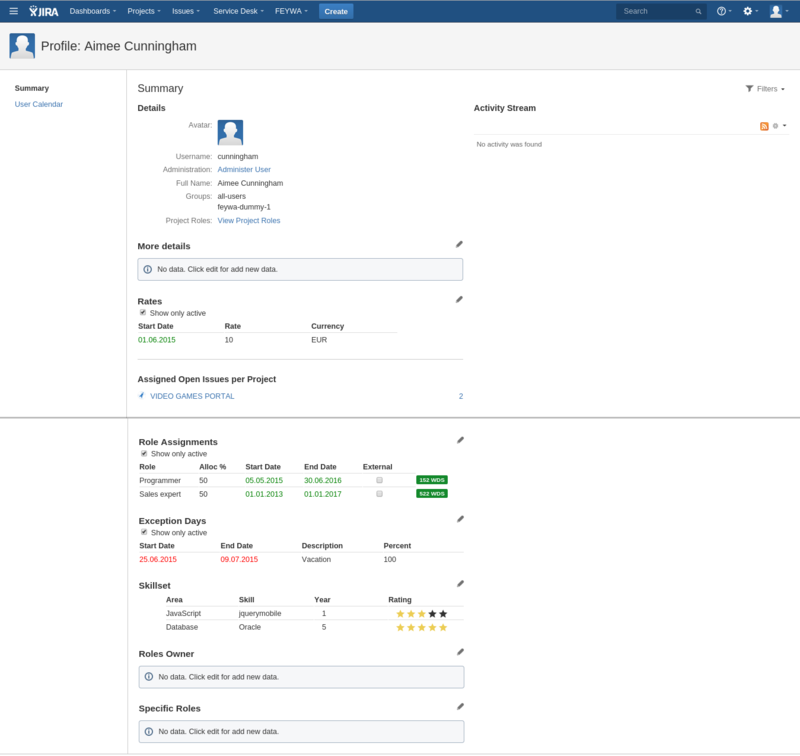 FEYWA for JIRA enables to fit the right projects in each release, because it shows the free capacity ready to use it to deliver more. Resource manager is always informed about availability of each role so he can take appropriate steps if there is lack or surplus of certain roles. 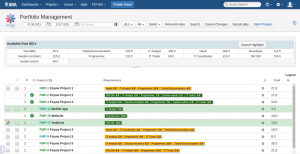 Resource manager sees utilization of each resource so he is able to manage reservations and allocations more effectively. Project manager is able to setup project details and role requirements and when the project goes live he is able to handle and review its execution. FEYWA for JIRA ensures that the right person is assigned on right tasks to avoid any potential mistakes. Team leader is able to assign tasks and ensure that project will be executed on time with required costs. Project planning module contains easy Drag&Drop interface. 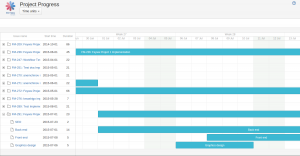 Team leader is also informed about exception days or holidays and sees other tasks assigned on certain employee inside his/her personal calendar. 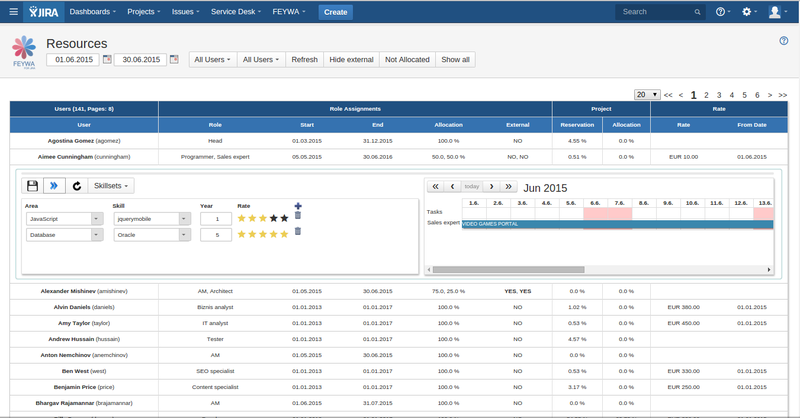 FEYWA for JIRA enables business analyst to do and update the estimations of work needed to deliver tasks. 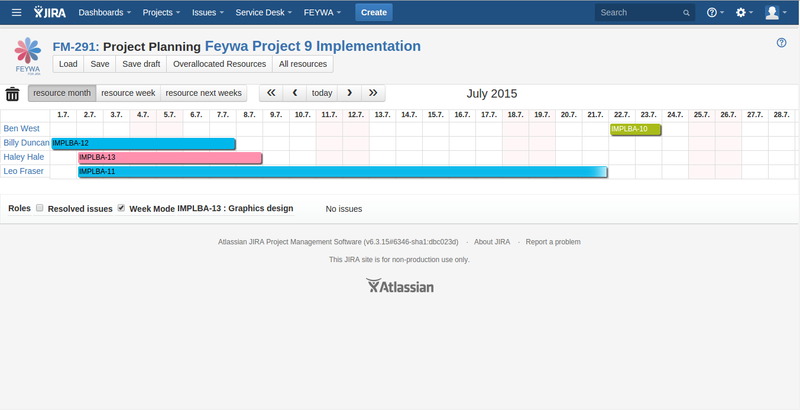 FEYWA for JIRA will help you when you use Agile methodology and play Planning poker, to see all your prior and record new estimations. Customer is able to raise new ideas and send them to approval. This ensures that product will be driven due to customer’s requirements and needs. Resource / Employee is notified about important information related to his projects. 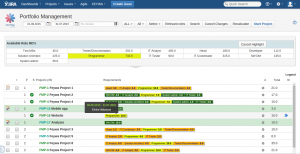 Employee can see what tasks is assigned on with all details, such as due date, etc.